While the Oshawa assembly plant to prepare for production of the Buick Regal has the intended North America next month, his mission has just taken a turn greener with the announcement of the Buick new Regal eAssist 2012 available this fall. The eAssist system reduces fuel consumption up to 24 percent compared to the Regal with four-cylinder engine and gearbox has six reports, allowing, estimated consumption of 8.0 L/100 km barely in the city and 5.4 L/100 km on the highway *. Fuel consumption outweighs competitors like the Acura TSX which consumes 9.3 L/100 km city and 6.2 L/100 km on the highway. Fuel consumption estimated Regal eAssist 5.4 L/100 km on the highway is 13 percent lower than that of the TSX, which offers no automatic transmission, standard equipment in the Buick. "The Award-Winning Buick Regal testifies to our expertise in the automotive sector, and the addition of the Regal with eAssist technology watch how we want to offer our customers a wide range of advanced options for our powertrains, whose performance energy efficiency, "said Kevin Williams has, president and general director of General Motors of Canada. "The integration of such technology in the reduction of fuel consumption our Oshawa Assembly Plant to be quite manufacturing system already in place and its legendary leadership. We are happy to pave the way for the production of energy efficient technologies in Canada. " 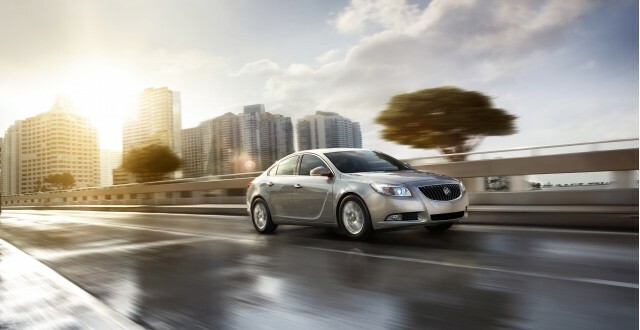 Regal joins the 2010 LaCrosse as a second vehicle Buick team technology reduction of fuel consumption. The eAssist system is composed of a lithium-ion cutting-edge technology and an electric motor-generator that enables regenerative braking function start and stop as well as a function electric assistance. The eAssist system can reduce fuel consumption, of course, but in addition provides excellent handling, a high performance maneuverability and quiet ride, all was thousands of dollars less than the same type of technologies offered by competitors . "Thanks to eAssist system, customers will not have to compromise on their driving experience to the benefit of energy efficiency," said Mr. Williams added. "We believe Regal and LaCrosse with eAssist provide more logical and affordable choice compared to other hybrid sedans intermediate and full size. " • wheels 17-inch light alloy pavement tires with low rolling resistance. • A way fuel efficient active by the driver for the air conditioner that allows the motor stops more frequent and longer duration. • An ECO gauge in the dashboard that continuously reacts to driver behavior behind the wheel to maximize the effectiveness of Conduct. • An indicator of power flow in the screen 7-inch infotainment system of indicating the flow of electric power system as the battery by regenerative braking and electric power fed to the engine. • Regenerative braking, which provides up to 15 kW of electricity to charge the battery. • Assistance to the electric acceleration, which produces up to 11 kW (15 hp). • Automatically stop the engine when the vehicle is moving. • Power dynamics of fuel supply down to stop the vehicle by reducing torque made possible by the motor-generator induction. • Intelligent Charge and discharge the battery at high voltage. "The ability to provide assistance to the electric drivetrain during rapid accelerations or driving on slopes optimizes the operation of the engine and the gearbox," said Steve says Poulos, global chief engineer for the eAssist system. "The power failure to judgments and during deceleration complements the electric braking assistance and recovery and cost savings of additional fuel. " 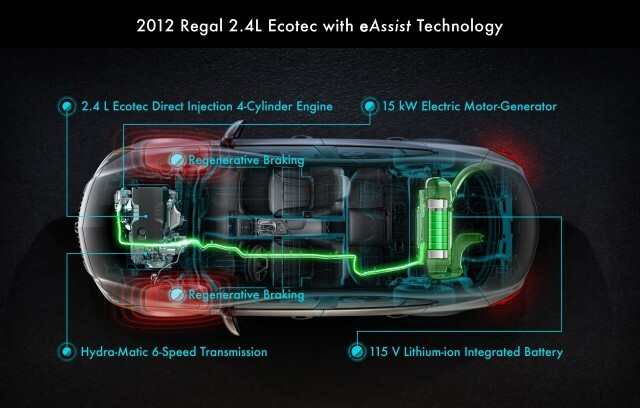 Regal with eAssist technology also displays an improved aerodynamics and tires have been optimized for performance and fuel economy. It is also equipped to help startup sloping accumulates brake pressure to help the driver to start more readily when the vehicle is in a moderate or steep grade. Aid to boot sloping greatly reduced the tendency of a vehicle when the engine is back to the stop. The lithium-ion 115V air cooled to the eAssist system reinforces the four-cylinder Ecotec 2.4L engine with an electric assistance of about 11 kW (15 hp) at sharp accelerations and 15 kW of braking recovery. The system also enables the Ecotec engine to shut off the fuel supply in certain deceleration conditions which increases the fuel economy. Fuel cut mode, all electric motor-generator continues to run with the engine to provide power to take immediate and smooth when the driver presses on the accelerator. Then, as the vehicle has slowed to a stop, the motor-generator set engine combustion has turned up a stop smoothly in position for a reboot also smoothly. "The battery is designed to provide assistance to an electric internal combustion engine, rather than storing energy for all-electric propulsion," said Mr. Poulos. "This is actually an extension of the conventional internal combustion engine and not its replacement. " The eAssist power pack contains the battery pack lithium ion battery, an inverter and an integrated electric power supply of 12 V. It is located in a compartment between the rear seat box and trunk; it is surprisingly compact and lightweight has a weight of only 29 kilograms (65 pounds). 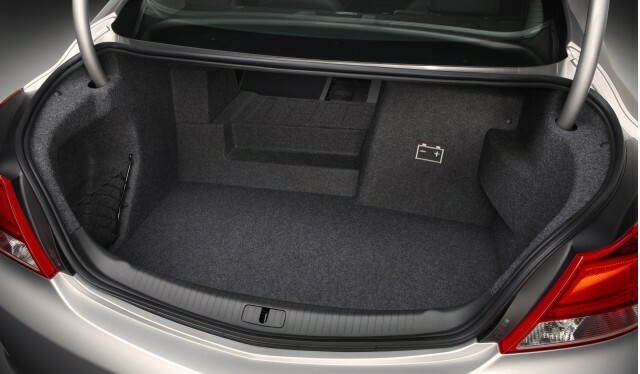 Trunk space is slightly reduced compared to that of 2011 models four-cylinder engine and a six-speed box, but household 314 liters (11.1 cubic feet) of storage. A quiet electric fan cools the power supply by drawing air from a vent located in the beach back, behind the rear seat. The electric motor-generator of eAssist system is mounted on the combustion engine in place of the alternator to provide assistance functions of the engine and producing electricity through a single drive belt system a combustion engine. The motor-generator is a high performance compact induction motor that is liquid-cooled for increased performance and efficiency. The eAssist system is paired powertrain Regal which consists of a four-cylinder 2.4L Ecotec direct injection and has an automatic transmission has six speeds new generation. In the Regal eAssist, the engine power is estimated at approximately 182 hp (136 kW) and the gearbox Hydra-Matic 6T40 new generation carries the transmission technology to new heights with features designed to increase the effectiveness powertrain. Of which have been made in equipment and controls clutch gearbox changes reduce internal losses skating while improving the timeliness and duration of gear changes. Supplemental electric energy supplied by the system provides reports for most students improve efficiency constant diet has no effect on the acceleration or drivability. The ability of the system to provide some electric assistance at cruising speeds allows the driver to accelerate lightly or ascend gentle slopes without demotion of the gearbox. An oil pump auxiliary electric transmission is added to the 6T40 box to keep it primed and the fluid continues to flow when the engine stops when the vehicle is moving. The gearbox is ready to operate and when the driver accelerates, for a driving experience any flexibility without compromise. 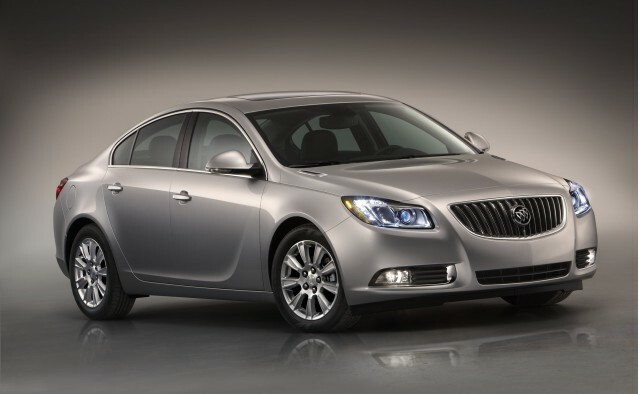 * 2012 Buick Regal equipped with a 2.4L engine, a six-speed gearbox and electric drive system eAssist. Data compiled based on tests conducted by GM in accordance with methods of APPROVED Transport Canada test. Your actual fuel consumption may differ. Approval ** fuel consumption of a 2012 Buick Regal equipped with a 2.4L engine, a six speed box and eAssist electric drive system according to established based on test data menes GM APPROVED in accordance with the methods of Transport Canada test. Fuel consumption ratings for vehicles of the competition after the 2011 fuel consumption by Natural Resources Canada and Wardsauto.com, upper intermediate segment Guide. Your actual fuel consumption may differ.